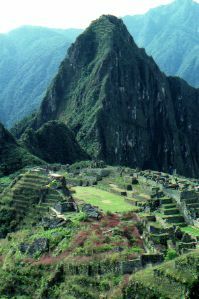 There are many options for excursions out of Lima, by far the most famous of which is the Inca citadel, Machu Picchu. You can also visit colonial cities and explore the massive Colca Canyon, which is twice the size of America’s Grand Canyon. For the adventure seekers, the Cordillera Blanca Mountain Range has some of the best trekking on the continent and contains the largest peaks in Peru. Below is a guide on how to get to some of the most important sites from Lima as quickly and efficiently as possible. Depending on how much time you have, you could either travel directly to Cusco, or you could take the scenic route and travel south along the coast to the Nazca lines, the Colca Canyon, and Lake Titicaca before heading inland to Cuzco and the Sacred Valley. Once in Cuzco you have the option of taking the classic four-day trek along the Inca Trail to Machu Picchu, or take an alternative, shorter route. Daily flights leave out of Lima to Cuzco, which is a one hour-flight. Daily buses can take you along the coast for a stop at the wildlife-rich Isla Ballestas, or for a tour of the vineyards of Pisco, the country’s wine and brandy capital. Just South of Lima are the Nazca lines, which you can reach either by bus from Lima, an eight hour ride, or by a one hour flight, which is offered by Aero Condor Peru that will fly you over the gigantic desert drawings. Flights are usually in the morning between 7 and 10am provided the skies are clear. Then you can travel by bus to explore colonial Arequipa, the massive Colca Canyon and then continue on to Lake Titicaca. Heading northwest from here you can also travel to Cusco , the gateway to the Sacred Valley and Machu Picchu. Only chartered flights can land at Huarez’s airport, but several bus companies have daily departures from Lima (8 hours). Once in Huarez there are many trekking tours within the Cordillera Blanca, which contains some of Peru’s most natural and untouched beauty. ok... what about all of the other stuff?? The article seemed more like an introduction than anything else... what about the coast? the northernmost penguins in the world live in Peru- the Humboldt Penguins. Plus there are all the cute little towns. Great intro, but would love for more info in the article.